Today I had the opportunity to attend the first annual and first in Canada to focus on Stomach Cancer conference. It was organized by “My Gut Feeling” which the first not for profit organization in Canada dedicated solely to stomach cancer. Similar to “No Stomach for Cancer“, it was founded by two stomach cancer survivors who realized that there wasn’t much information out there on stomach cancer nor a place to network or with patients, survivors, or caregivers. It was founded in 2016; however, I stumbled upon their web page earlier this year. I am part of many groups on facebook that provide support to those who have had partial or total gastrectomies or the CDH1 gene mutation. Many people ask questions and they are from all over the world. The great thing about My Gut Feeling is that they can help Canadians navigate the health care system and offer support as well as spreading awareness and advocating for Gastric Cancer in Canada. I learned many things today and heard many personal stories. The thing about attending these conferences is that they always pull on your heart strings. You hear personal stories from survivors, caregivers, or patients and it reminds you of where you’ve been and how far you’ve come. You hear talks from medical professionals who push to advocate for stomach cancer research where there is very little funding. You meet others who have been through similar situations and you realize that you aren’t alone. Oh, and you usually get a lot of breaks with food because you know a chunk of people in there don’t have a stomach. There are many more wonderful things that I could share about this conference as it was so fantastic; however, I wanted make a quick blog post before bed and it is about an event I learned about which is occurring this Thursday in Canada. 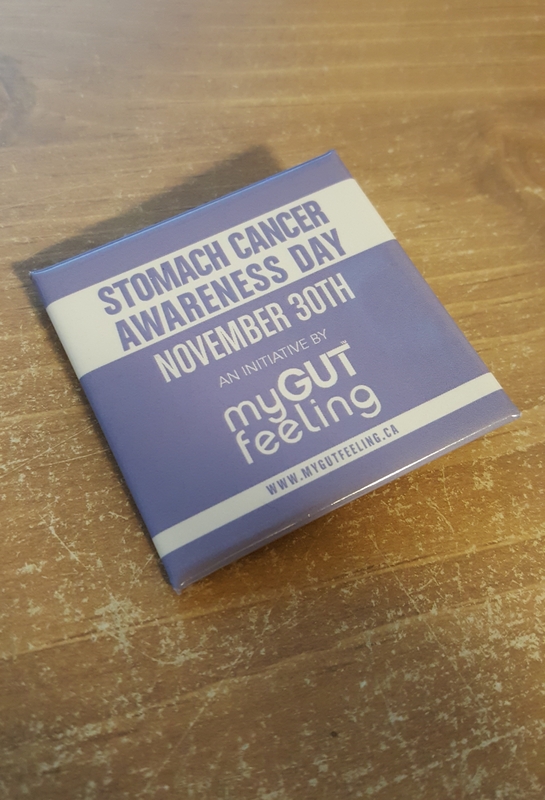 My Gut Feeling has organized a Stomach Cancer Awareness Day on November 30th. In honour of this day the CN Tower in Toronto will be lit up periwinkle blue. So will the city hall towers and the Toronto sign. Not only that, the city halls and landmarks in Victoria, Vancouver, Edmonton, Montreal, and Halifax will light up as well. If you are near any of these landmarks, I ask that you snap a photo of yourself near it with #MGF365 to help raise awareness about stomach cancer.